General purpose hot works (such as welding, grinding or gas cutting or any activity that produces a spark or flame) are not to be done in the open. The NSW RFS strongly recommends you reconsider activities such as such using a tractor or slashing, to help reduce the chance of a fire starting on your property. Under certain conditions, the NSW RFS may issue a Harvest Safety Alert. Why are Total Fire Bans declared? To reduce the risk of fires damaging or destroying life, property and the environment the NSW RFS Commissioner may declare a Total Fire Ban. Can I use an electric barbeque? You can use an electric barbeque for cooking as long as it is under the direct control of a responsible adult, who is present at all times while it is operating, and no combustible material is allowed within two metres at any time it is operating. Can I use a gas barbeque? The barbeque is within a designated picnic area and the appliance is approved by Council, National Parks or State Forest. Can I use a barbeque or pizza oven which burns solid fuel (e.g. wood, charcoal or heat beads)? No. A barbeque or wood fire pizza oven which uses solid fuel, such as wood, charcoal or heat beads, cannot be used outside during a Total Fire Ban. Can I use fire during a Total Fire Ban if I have a fire permit? Permits are suspended on days of total fire ban. Permits may resume after the total fire ban is lifted, as long as the permit hasn't expired. More information on permits can be found on our Fire Permit page. What is a No Burn day? The EPA may prohibit the burning of fires in the open or in incinerators by issuing a No-Burn Notice (see section 133 Protection of the Environment Operations Act 1997) if it is of the opinion that, because forecast weather conditions, burning is likely to contribute to the build-up of air pollution. call the EPA Environmental Information Line on 131 555. Are there any exemptions during a Total Fire Ban? A range of activities may be exempt from Total Fire Bans, such as emergency infrastructure work, bee hive smokers, mining operations, sugar cane harvesting, use of fireworks or ceremonial fires. The NSW RFS Commissioner is responsible for exemptions to Total Fire Bans. These exemptions are detailed in the NSW Government Gazette each time a Total Fire Ban is declared. How do I apply for a Total Fire Ban exemption? If you want to light a fire, or carry out any hot works activities during a Total Fire Ban you can check the Government Gazette to see if there is a standard exemption that applies to your situation. If the standard exemptions don't cover your circumstances then you may apply for a specific exemption using our Total Fire Ban exemption application form. You will receive an acknowledgement email upon our receipt of your application however a minimum of seven days processing time is required for us to assess your application. 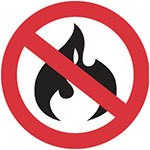 If approved the NSW RFS will issue an Exemption that contains any conditions that you must follow when lighting the fire or conducting your activity on the total fire ban day. What penalties are there for lighting a fire during a Total Fire Ban? Lighting a fire on a day of Total Fire Ban attracts an on the spot fine of $2200. If the matter goes to court, you could be subject to a fine of up to $5500 and/or 12 months gaol. Penalties for a fire that escapes and damages or destroys life, property or the environment can attract much greater fines and gaol terms with maximums at $132,000 and/or 14 years gaol. Call your local NSW RFS Fire Control Centre, or local Council for further advice.